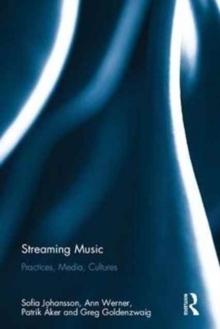 Streaming Music examines how the Internet has become integrated in contemporary music use, by focusing on streaming as a practice and a technology for music consumption. The backdrop to this enquiry is the digitization of society and culture, where the music industry has undergone profound disruptions, and where music streaming has altered listening modes and meanings of music in everyday life. The objective of Streaming Music is to shed light on what these transformations mean for listeners, by looking at their adaptation in specific cultural contexts, but also by considering how online music platforms and streaming services guide music listeners in specific ways. Drawing on case studies from Moscow and Stockholm, and providing analysis of Spotify, VK and YouTube as popular but distinct sites for music, Streaming Music discusses, through a qualitative, cross-cultural, study, questions around music and value, music sharing, modes of engaging with music, and the way that contemporary music listening is increasingly part of mobile, automated and computational processes. Offering a nuanced perspective on these issues, it adds to research about music and digital media, shedding new light on music cultures as they appear today. As such, this volume will appeal to scholars of media, sociology and music with interests in digital technologies.